Thanks for reading the Steamboat Daily Snow during the 2018-2019 season! It was an amazing season indeed, with snowfall that was near average from November to February (near average = great conditions!) and then we saw 2-3x normal snowfall in early March. 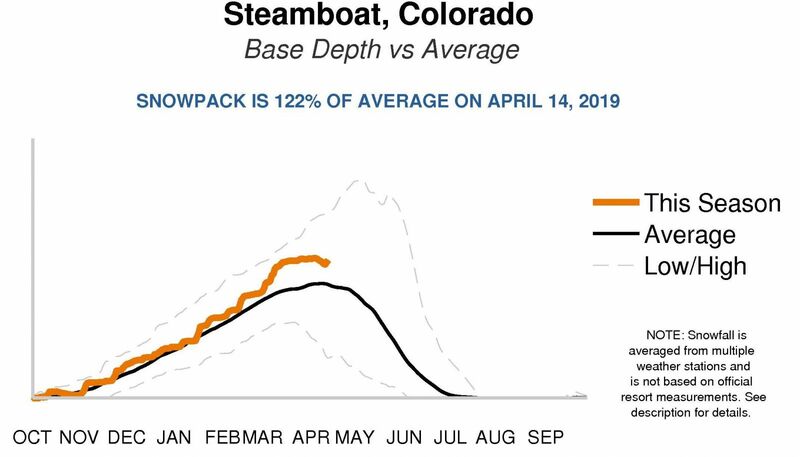 The orange line on the graph below shows how this season’s snowpack was near average through February, and then jumped WAY up in March. We closed the season at 122% of average snowpack. Wow! I hope you have a fantastic summer, and I’ll see you back here in November when I start writing the Steamboat Daily Snow for the 2019-2020 season. Thanks so much for reading and for your support of Steamboat, myself, and OpenSnow.com! No need to refresh! As an All-Access subscriber, receive the daily snow by email.